Vaccines are highly effective at reducing infectious disease and are recognised by the World Health Organization as second only to clean water at effectively controlling disease (Andre et al 2008). The success of any vaccine programme relies on enough people being vaccinated to control or stop the spread of infections. In the UK, numerous different vaccines have been successfully introduced over the past 50 years and many once common infections are now rarely seen. To ensure continued disease control, it is essential to maintain a high vaccine uptake and to make sure that vaccines are given safely and effectively. To achieve this, those who advise on and/or administer vaccines need to be knowledgeable and skilled. They also need to be able to answer patients’ and parents’ questions confidently and accurately, and be able to explain why vaccines are needed, while dispelling any myths or concerns that may arise. 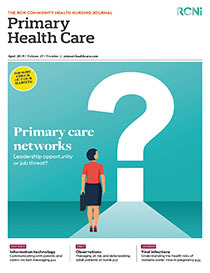 This article discusses the revised national immunisation training standards and core curriculum (Public Health England 2018) and highlights the supporting resources which are available for all healthcare professionals with a role in immunisation to help them to be confident, competent, well-informed and up to date.